It always feels like Kenneth Branagh’s having a great time. It doesn’t even matter if the film is a lost cause – see Jack Ryan: Shadow Recruit or The Gingerbread Man – you can tell he’s doing what he loves, and it’s not long before he’s on to the next project, whether that be directing or performing or both. 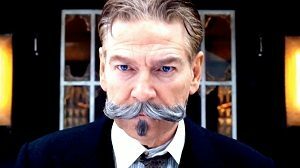 David Suchet completed his 24-year run in the BBC Poirot adaptations four years ago, and now it seems Branagh’s ready to take the reins. His interpretation of the sleuth is distinct yet clearly honours Agatha Christie’s creation, whilst he heavily hints where he wants to take his detective for the sequel. The only real problem with Murder on the Orient Express is that, well…if you’ve read the book or seen a different adaptation before, then you know how it ends. And it’s not the type of solution that you easily forget. In fact, out of all the Christie books I’ve read, this is one of probably only two or three where I can’t shake the reveal from my mind. This was always going to temper my enjoyment of the film. So for those of us who’ve seen it all before, what is there to appreciate? Well, obviously we have the star-studded cast. Daisy Ridley, Johnny Depp, Willem Dafoe, Judie Dench, Josh Gad and Penelope Cruz all feature, all immaculately coifed and costumed. Thankfully it appears that all were able to be present on set at the same time too, unless it’s simply a case of visual effects coming a long way since The Expendables 2. Speaking of VFX, the film is chock full of them. Whilst the train is stuck for most of the runtime, Branagh ensures that the backdrop is nothing short of breathtaking. The effects are mostly great, except for a couple of stumbles. More importantly, Branagh and his cinematographer, Haris Zambarloukos, know how to shoot a movie on a train. There are dozens of immaculately conceived shots, and whilst we get scene after scene set in train compartments, no one shot is the same. Despite being disappointed by Zambarloukos’ work in the single-setting film, Locke, a few years ago, here he can really let loose. Seriously, if you want to know how to shoot a scene in a confined space, this is the feature to study. Murder on the Orient Express is an enjoyable murder mystery, and Branagh’s interpretation of the character can sit comfortably next to Suchet’s. Recommended. This entry was posted in Film Reviews and tagged Mystery, Period Drama, Thriller by Stuart Wilson. Bookmark the permalink.